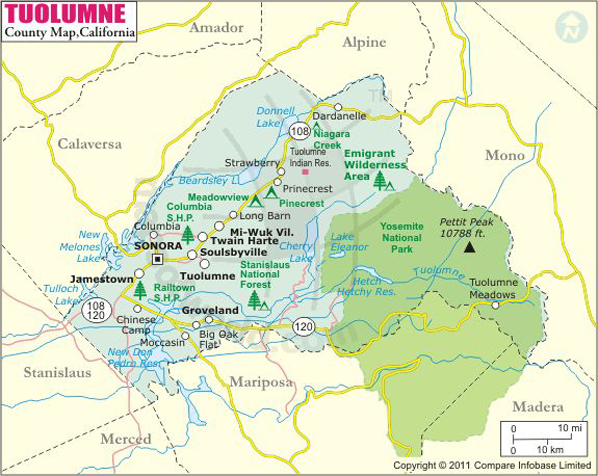 Below is the County Map of Tuolumne in California showing the boundaries, roads, highways, towns and much more. The pristine, scenic expanse of the county in the Sierra Nevada foothills lies about two and half hours east of the San Francisco Bay Area. The Stanislaus National Forest, Yosemite National Park and other wilderness areas offer natural vistas and activities including hiking, skiing, horseback riding, fishing, rafting, snowmobiling, and boating. Scores of endless adventures await in this land of purple mountain majesty. Gold Rush-era towns & saloons, wineries, and historical museums make the county a year-round destination. Pine Mountain Lake, Mono Vista, Jamestown, and Columbia are picturesque census-designated places in Tuolumne County. Railtown 1897 State Historic Park, Table Mountain, Hetch Hetchy, and Yosemite Valley are notable attractions in the county. State Highways 108 and 120 enter from San Francisco and East Bay Area, while SR 49 comes in from the north. The State Route 120 allows direct access to Yosemite National Park. Airports in Pine Mountain Lake and Columbia are used mostly for general aviation.